In April 2004, Gunnery Sergeant Jean-Paul Courville not only proved his leadership skills but also his courage and tactical abilities as he led a team during battles in Karmah Iraq. The New Orleans native was responsible for providing ammunition and water resupply to K Company, 3rd Battalion, 4th Marine Regiment, First Marine Division in Fallujah/Karmah. However, during several hours of fighting to suppress and destroy enemy fighters with F-15 Eagle 20mm gun runs that were dangerously close, Courville fearlessly led a team of heavy machine gun high mobility multi-purpose wheeled vehicles and two amphibious armored vehicles to support Company K with casualty evacuation and machine gun fires. With this success in al Karmah, the urban combat was far from over. Courville repeatedly entered the most dangerous areas of the battle to provide support, direct machinegun fire, ammunition, and water resupply. On April 13, during more than eight hours of fierce urban fighting, four fellow Marines were shot and a reinforced squad was thrown from their overturned 7-ton vehicle. During the ensuing battle, Courville personally rescued the squad during the night insertion. He led the team through more than 200 enemy fighters to conduct four separate missions to evacuate Marines wounded during the fighting. His bold action and rapid care under fire enabled all Marines to survive even though helicopter evacuation was not feasible. Kilo Company (reinforced) was then tasked to attack and clear into the eastern flank of the city of al Fallujah. Manpower was short but Courville was undaunted. He assumed the difficult dual role as Company first sergeant and Company gunnery sergeant and was instrumental in preparing the Company for the task. Approximately 500 meters into the city, Kilo Company encountered an entrenched enemy who was determined to fight to the end. During an extensive battle with this enemy, Courville disregarded his own safety as he ensured his fellow Marines were adequately supplied with ammunition, water and motivation. Later during the assault, Courville saw a family trapped within a building that was covered with flames and smoke. Somehow the family, weakly waving a white flag from a window, had managed to survive. He quickly assessed the situation as desperate and led his team to the burning building to lead the family to safety one by one. Bringing up the rear, Gunnery Sergeant Courville picked up two of the children and sprinted across the danger area that was regularly raked by enemy machine gun fire. For these heroic achievements, Gunnery Sergeant Courville received the Bronze Star Medal Combat Distinguishing Device. 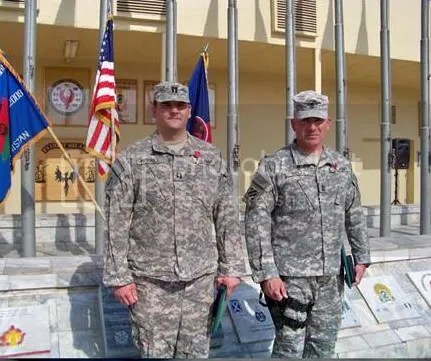 On Nov. 11, 2008, CPT Joseph Merrill and 1SG James Meltz, Company Command Team, D Co., 27 Infantry Brigade Combat Team, New York Army National Guard, were awarded the Bronze Star for Valor for their actions south of Kabul on the night of May 25, 2008…. Go read their story here.